Co. Longford: Agharra, Ardagh, Ballymahon (2), Ballynamuck (2), Cashel (2), Drumlish (3), Edgeworthstown (2), Forgney, Kilcommock, Kilglass, Killashee, Longford (4), Mohill, Moydow, Newtown Forbes (2), Rathline, Taghshenood, Taghshinny. The Board also included 10 ex-officio Guardians, making a total of 40. The Guardians met each week on Saturday at noon. The population falling within the Union at the 1831 census had been 85,152 with divisions ranging in size from Taghshinny (population 2,447) to Longford itself (10,344). The new workhouse, built in 1840-42, was designed by George Wilkinson. It occupied a 7-acre site at the east of Longford and was intended to accommodate up to 1000 inmates. Its construction cost £7,000 plus £1,580 for fixtures and fittings etc. It was declared fit for the admission of paupers on 24th March 1842 and admitted its first inmates the same day. The workhouse location and layout are shown on the 1914 map below. The buildings appear to have broadly followed Wilkinson's typical layout. An entrance and administrative block at the north contained a porter's room and waiting room at the centre with the Guardians' board room on the first floor above. The block was later extended at its west side and on the 1914 map is indicated as being a school building. Longford rear of entrance block from the south. 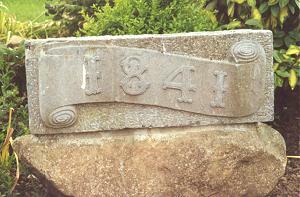 Longford entrance block date stone, 2000. The main accommodation block had the Master's quarters at the centre, and male and female wings to each side. At the rear, a range of single-storey utility rooms such as bakehouse and washhouse connected through to the infirmary and idiots' wards via a central spine containing the chapel and dining-hall. In common with other unions in Ireland, Longford suffered greatly during the famine years 1845-50. The workhouse was greatly overcrowded with over 2,300 inmates at the end of 1848. Disease, particularly typhus fever, was rife and a 64-bed fever hospital was erected at the south of the workhouse. Because of the spread of fever, the Board of Guardians moved their meetings away from the Board Room in the front block of workhouse and met in other places such as the town Courthouse. As in other places, the number of deaths (over 16,000 in the first ten years of the workhouse's operation) necessitated the creation of mass graves in a famine graveyard on land adjoining the workhouse at the south. The graveyard which became known as "bully's acre" was also, in later years, used for the burial of still-born infants. Of limestone tall and fine. Fever was in the air. Held a thousand Irish souls. (The Longford workhouse date-stone actually reads 1841 rather than 1839 and none of the new Irish workhouses came into use before 1841.) The Colum family were forced to leave their home at the workhouse in 1888 because of the Master's debts and lack of application to his duties. At the 1901 census, the population of the Union was 22,312 with 17 officials and 208 inmates in the workhouse. Following the creation of the Irish Free State in 1921, the workhouse was renamed Longford County Home. Then, in 1952, it became St Joseph's Hospital. The old workhouse buildings were demolished in around 1970. The former fever hospital is now Mount Carmel Hospital. In the mid-1990s, to mark the 150th anniversary of the Great Famine, work was undertaken to renovate the graveyard which, by then, was totally neglected and overgrown. It has now been transformed into a landscaped area with commemorative cross and plaque. 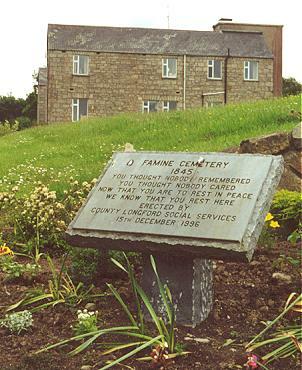 Longford workhouse memorial plaque, 2000. 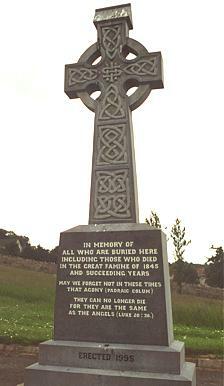 Longford workhouse memorial cross, 2000. Longford County Library, Town Centre, Longford, Co.Longford. Holdings include Longford Union minute books (1839-1922).